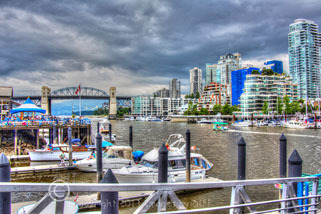 click photo to enlarge We entered the port of Vancouver, British Columbia Canada under the Lions Gate Bridge. The bridge is just over a mile long, and is 364 feet tall. It is a suspension design that looks similar to the Golden Gate Bridge in San Francisco. Arriving, we noticed a lot of very tall apartment buildings in downtown Vancouver. It reminded us both of Hong Kong. In the U.S., downtown buildings are usually office buildings, and most people live in the suburbs. 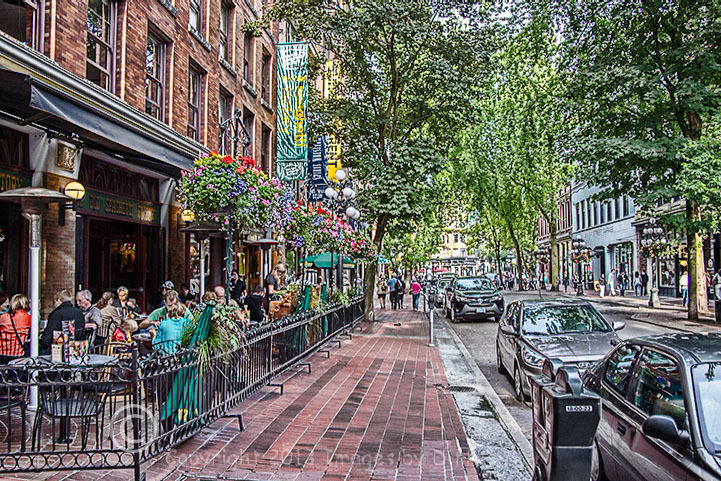 In Vancouver & Hong Kong, many people live, work, shop & eat in downtown. We spent 3 nights in Vancouver and used the Vancouver Trolley company’s hop-on hop-off trolley, and taxies to get around the city. 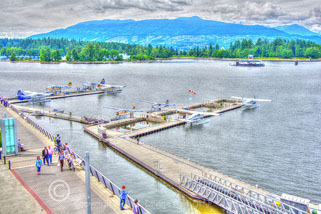 click photo to enlarge One of the famous things in Vancouver is Stanley Park, a 1,001 acre park. 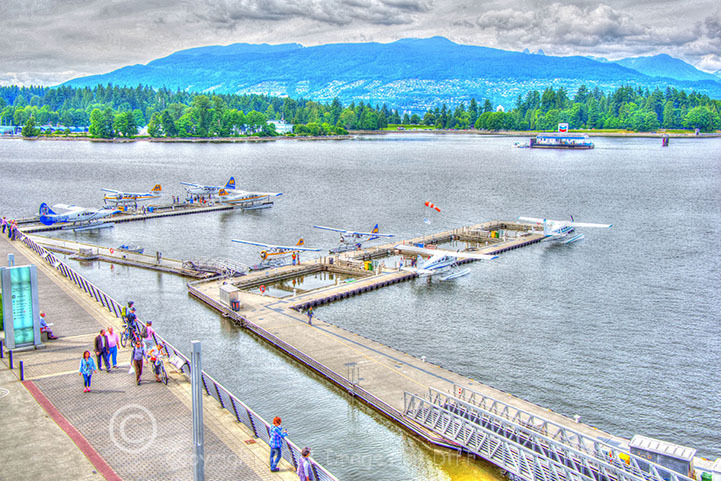 On June 18th, 2014 Stanley Park was named ‘top park in the entire world by TripAdvisor. They do have a wonderful all-purpose trail around the park that has lanes for walkers, joggers and bike riders. In fact this same path goes around much of the city. 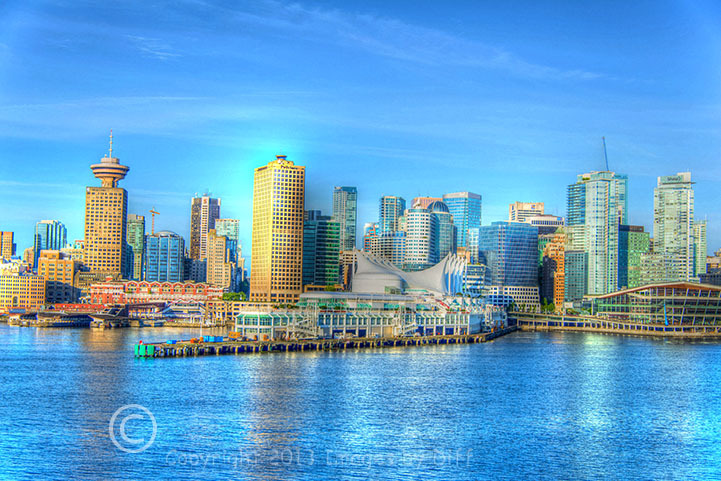 The city of Vancouver was once named Granville, until it was renamed in 1886. 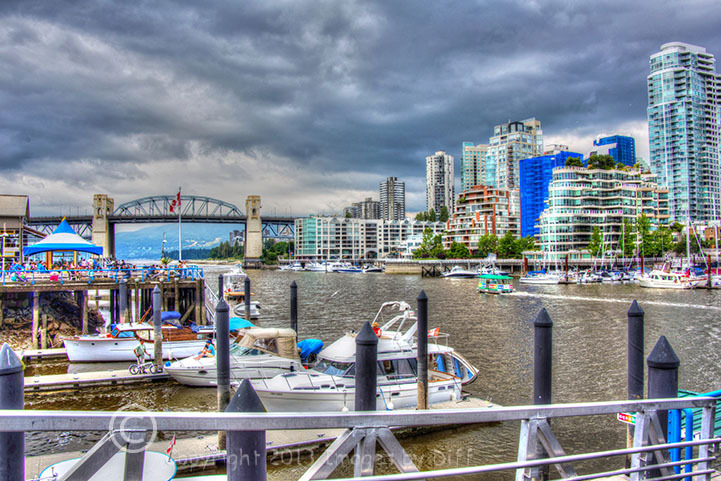 Today Granville Island refers to an interesting little shopping district on a peninsula in Vancouver. 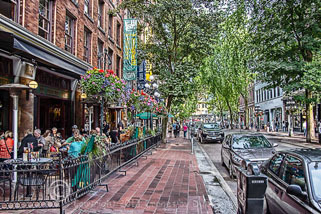 Our hotel was on Robson Street, which was a shopping and restaurant district in Vancouver. click photo to enlarge There were many different areas of Vancouver to explore like Gastown, China Town, Granville Island, Robson Street, Stanley Park, Round House, and the downtown port area. The picture to the left is in the A-maze-ing Laughter statues. 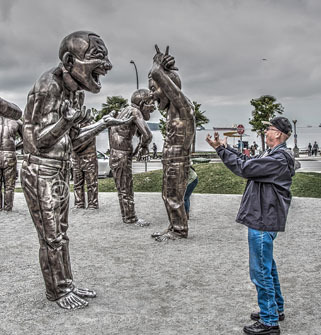 It is composed of 14 statues each about 9 ft. tall and weighing over 500 lbs, and portrays the artist's own image "in a state of hysterical laughter". It was kind of funny to see people come up and just take a photo standing in front of it.. I had to tell them mimic the statues. Then they would start laughing too. On our Trolley Tours, we discovered another reason Vancouver reminded us of Hong Kong is that in the 1980s, when England had talks with China about the sovereignty of Hong Kong, plans were announced to turn Hong Kong over to China in the 90s, according to treaties. At that time, some Chinese investors built Hong Kong-style apartment buildings in downtown Vancouver, and they sold very quickly to the Chinese. One big difference to us was they did not have clothes poles hanging out the windows, like we saw in Hong Kong in 1997. The Vancouver apartments are also much larger than Hong Kong apartments which are about 400 square feet; the ones in Vancouver were around 700 square feet.